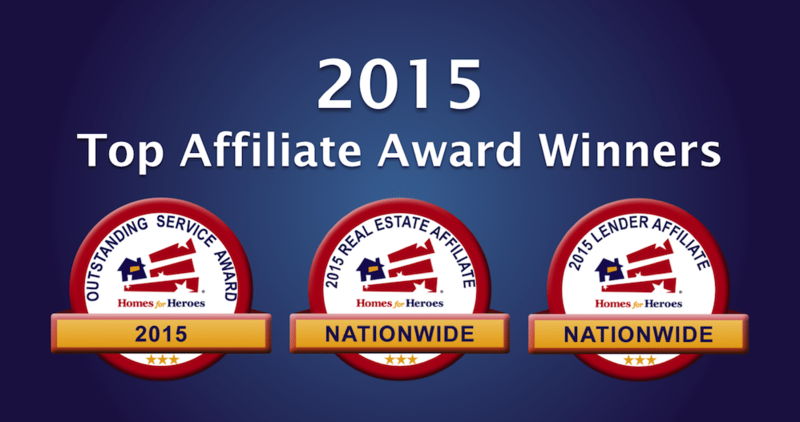 Homes for Heroes, Inc. recognizes and congratulates these affiliates as the top performers in the country. Combined, they have served hundreds of heroes nationwide and were a large part of Homes for Heroes giving back over $5.1 million to our heroes (firefighters, law enforcement, military members (active, reserve and veterans), healthcare workers and teachers. The Outstanding Service Award is awarded to exemplary Homes for Heroes affiliates who consistently go above and beyond in reaching and serving the heroes of their communities. These affiliates positively impacted the most heroes lives in 2015 by providing them with extraordinary service and savings when they bought, sold or refinanced a home. Thank you all for your committed service to our countries heroes, and congratulations on your achievements! If you’re a hero looking to work with one of our outstanding affiliates to buy, sell or refinance a home AND receive significant savings, please visit HomesForHeroes.com and complete the two-step sign up process and our affiliate real estate specialist in your area will contact you. Congratulations to all of our Homes for Heroes, 2015 award recipients. Your passion for serving heroes by saying “Thank You” in the form of significant rebates, discounts and exemplary service is inspiring to all of us at Homes for Heroes. Thank you for of the other countless ways you say “Thank You” even beyond the real estate savings program. We couldn’t accomplish what we do without you.